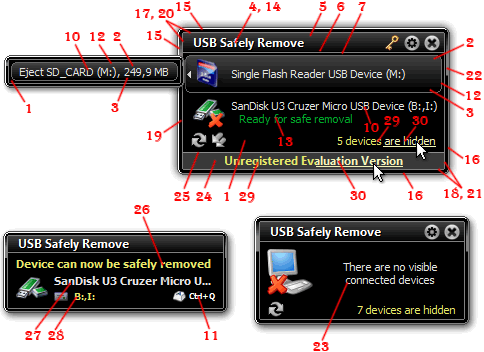 USB Safely Remove Ayuda - How to use skins? Ayuda > How to use skins? Everyone knows that every man to his own taste. So the skin supporting is one of the most important things to make the program to look like you prefer. 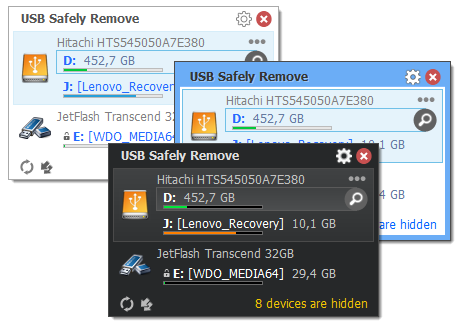 USB Safely Remove supports skin changing for the stopping menu and some other frequently displayed windows. Easy, isn't it?� Don't like any of the predefined skins and wish to make your own one? Create a new folder with the name of a new skin (e.g. "C:/Program Files/USB Safely Remove/Skins/My Own Skin"). Create images following specified names using your favorite graphic editor. The easiest way to not miss an image is to copy all images from an existing skin folder to your new skin folder. Then you can edit just copied images in a graphic editor. If an image file won't find by the program it will be got�n from the default skin (it's named Default in the list of skins in the Options and actually is build into the program body so you may not see its folder and files). selecteditembottom - the bottom part of the device item gradient fill. itemtext - the color of the device(drive) name (the device item caption). textshadow - the color of header caption shadow in the stopping menu and the notification window. windowlefttopedge - a top and left hand outside line color of the frame around window. windowrightbottomedge - a bottom and right hand outside line color of the frame around window. windowlefttopinneredge - a top and left hand inside line color of the frame around window. windowrightbottominneredge - a bottom and right hand inside line color of the frame around window. windowlefttopinneredge2 - the color of the line inside the frame around window at the top and left hand side. 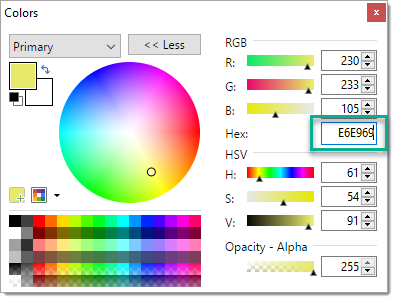 windowrightbottominneredge2 - the color of the line inside the frame around window at the bottom and right hand. balloonbodytext - the color of the device(drive) name in the notification window. balloondrivelettertext - the color of the drive letter list text in the notification window. underlinedlink - the color of the underlined reference link in the normal state.